I first met Cherie Jerrard at last year’s Cup North, although we had corresponded beforehand over a period of a couple of months. Cherie is a talented illustrator who has turned her hand to capturing scenes of every day café culture. I find her work endlessly fascinating and very much a contrast to what I do with my photo galleries, although we each, in our own ways, try to tell a story. You can see what I found in the gallery. Cherie draws scenes of every day café culture, often combining her sketching with photography, something I’ve not seen before. She also tends to mix multiple perspectives and/or multiple time-frames, so rather than an illustration being a single snapshot of the café at a specific moment in time, it’s more of a story in itself. Another of Cherie’s techniques is to intersperse her work with quotes and snippets of conversations that she’s overheard while making her sketches, which adds another yet dimension. You can read more about Cherie’s work (in her own words) in an interview she gave to Urban Sketchers. Like the Coffee Spot, Cherie travels to sketch café life around the country and beyond. 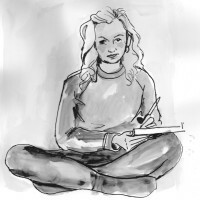 You’ll find works from her home town on Shrewsbury, including the Shrewsbury Coffeehouse, as well as Manchester, where Cherie completed an MA in Illustration last year. She’s drawn some of my favourite places in Manchester, such as Grindsmith on Deansgate. Cherie has also gone further afield, including to London, where she’s illustrated café life in the likes of Fernandez & Wells, in Somerset House. At the end of last year, Cherie travelled to New York and, naturally, her trusty sketch book and pens went with her. When we met at Cup North, Cherie picked my brains for good places to sketch, so I was particularly pleased to see illustrations in the exhibition from the Brooklyn Roasting Company on Jay Street, as well as various New York and Brooklyn diners. Hopefully I’ve whetted your appetite: if I have, you’ve got until the end of February to catch Cherie’s exhibition “Cherie Did This: Reportage Illustrations Documenting The Cafe Culture Of Our Time” at the Shrewsbury Coffeehouse. Failing that, you’ll have another chance to see the exhibition in April at Manchester’s Ancoats Coffee in the Royal Mills. If you can’t wait until then, Cherie’s also produced a newspaper which you can buy on-line and you can see a large-scale installation of one of her illustrations at Grindsmith on Deansgate. If you would like Cherie to illustrate your coffee shop or if you would like to host an exhibition of her work, then I’m sure she would be happy to oblige. You can find her contact details on her website. This entry was posted in Information, Shrewsbury by Brian Williams. Bookmark the permalink. You’ve summed this up perfectly ! Thanks 🙂 Glad you liked it!